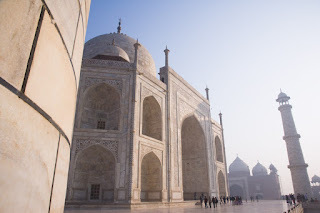 I spent most of February in India shooting photos for a new guidebook. One of the locations on my shot list was the Taj Mahal. It was great to have an excuse to visit one of the most famous buildings in the world. But how do you photograph it without just endlessly repeating what's been done before? The Taj was completed in 1643 and the earliest photograph I can find of it was taken in 1854 by a Dr John Murray. He put it on display in the Bengal Photographic Club. With a photographic legacy stretching back over 150 years, how can you hope to come up with something that is new? Often I find the answer is not even to try. I arrived at the entrance while it was still dark and waited for it to open at 6am. There were about 20 people behind me when they let us in, and after a short walk to the massive southern gate I was face to face with one of the most photographed views in the world. Through the darkness I could just make out the line of the rectangular lake leading up to the silhouette of the four towers and perfectly proportioned dome. It was magical. We all just sat down and watched as the sky slowly lit up as the sun rose. And when it did, I took a photo. More than one in fact. Yes, it is a view that has graced a million postcards and been on the front cover of hundreds of books. But there is a very good reason for that - it's a truly beautiful view! I can't imagine any photographer visiting it for the first time not taking that picture - you can't help it. Over the next few hours I wandered through the whole complex and took maybe 200 pictures. Some of them I think are a bit different - like the one at the top of this post - or at least I haven't seen one from this perspective before. But whenever I visit a famous place, it's the same. I have to get the cliché shots out of the way first. Only then can I free up my mind to see the subject in a different way. So don't be afraid of shooting clichés. Just make sure you give yourself enough time to get beyond them. Do post a link if the non-cliche shots ever make it to the web -- I'd love to see them! All content (c) Julian Love. Awesome Inc. theme. Powered by Blogger.